USNEA; USING USNIC ACID AS A FISH REMEDY FOR TUMORS AND MORE. How Usnic acid and Mucilage which are both found in Usnea lichen can be used as effective alternative aquarium and pond fish treatments. 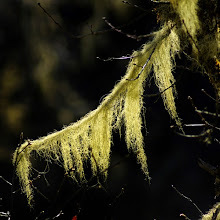 Scientific name: Usnea barbata Usnea is a lichen of the family Parmeliaceae that grows in damp temperate woodlands and contains usnic acid (C18H16O7). I have found it effective for bacterial (some gram negative and most gram positive), fungal and even parasites such as ich. The other active ingredient (besides usnic acid) is mucilage. As a natural antibiotic it has also proven effective against gram positive bacteria, such as Mycobacterium tuberculosis (making Usnea a great alternative to Isoniazid). Scientists believe that usnic acid works by disrupting cellular metabolism, either by preventing the formation of ATP which is the cells' energy source or by the stopping the action of oxidative phosphorylization. Usnea may also be a better choice than the drug metronidazole (as per human studies) for parasites and anaerobic bacterial treatments in aquariums. Usnea contains potent antibiotic properties on gram positive bacteria and antifungal agents that are broad spectrum and effective against all gram-positive and tuberculosis bacterium. As well, the Usnic acid found therein has shown antiviral, anti-protozoal, anti-inflammatory and analgesic (pain killer) activity. It is also noteworthy that Usnea is edible, with no known toxic side effects from ingestion in animal and human studies and as well is an excellent source of Vitamin C.
Test tube studies have suggested an anti-cancer and an anti-viral activity for usnic acid. This may also make Usnea useful for the hard to treat aquatic viral disease; Lymphocystis (which is usually not fatal in otherwise healthy fish). The human studies can also be transferred to fish for tumors. I personally have not tested this enough as of writing this article, but based on human studies and the few tests I have done, Usnic acid shows promise here. Topical treatment. This is where there is a lot of evidence is for usefulness. This has been shown in human and my own treatments to be very useful for wounds (many Native Americans used Usnea as a compress for battle wounds to prevent infection and gangrene). The anti-infection properties make Usnea a useful and more potent alternative to Melafix for injuries or similar damage. Gill infections: due to the Mucilage (gluey substance produced by most plants and some microorganisms) contained in the Usnea it has been shown to have healing properties in areas of respiration. 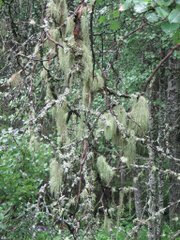 This is another area where Usnea can and does “shine” in its possibilities and now proven usefulness. Due to the healing properties of mucilage, Usnea is an effective tool in treatment of ammonia burns to the gills, especially used immediately after exposure (such as shipping). When used along with proper mineralization (such as calcium ions). Usnea can also be used after injury from Flukes or a fish that is found “outside an aquarium” due to jumping in re-establishing gill slime and function. Digestive problems: which is an area where much human research also has shown significant effectiveness. Usnea can be a replacement for Neomycin or Metronidazole for use in digestive diseases, possible swim bladder infections and even possibly Dropsy (although there is limited evidence of usefulness for Dropsy as of yet). With intestinal Problems, Usnea (usnic acid) has been shown to have similar properties to Metronidazole. -VERY Preliminary results so far. Pond Treatment; I have rather unscientifically thrown handfuls Usnea (after observing ponds in forested areas that have Usnea fall naturally in the pond have low disease incidence including parasite), and observed fast healing of injuries vs. doing nothing (admittedly this is anecdotal, not a scientific study). Streptococcus; although there is not much use in fish studies for this, in human/veterinary culture studies Usnea shows an ability to kill gram positive Streptococcus pathogens. My recommendation is to use Usnea in a 30 bath (possibly with Methylene Blue) while treating with Erythromycin in tank. In severe cases Usnea might be combined with Erythromycin in tank. Whitish patches or irregular growths on the fish most commonly on the tail and fins. These eventually become quite large and give rise to the name Cauliflower Disease. This remedy is still in the testing phase, but early results are promising. The Usnea Lichen is proving to be the most effective natural remedy early in my testing this lichen is boiled like a tea then added to the aquarium. I boil one small sprig (about an adult thumb size) in 6 oz. 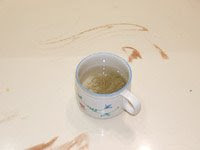 of water and add this to every 10-20 gallons of water every day until cure is effective +2 days. Make sure to remove the Usnea sprig from the “brewed Usnea tea”, otherwise this will allow the tea/medication to spoil. I also recommend refrigeration after brewing of any unused Usnea brew. 1 tablespoon per 6 oz. of this preparation can also be used for a 1 quart bath as an alternative (This is my preferred Use of Usnea!). Please keep in mind that at this point I would consider this an experimental treatment, mostly in actual dose, so ANY positive or negative feedback is welcome, especially as per dosing effectiveness. As to the actual effectiveness, there is enough evidence in my own trials and even more so in well researched human trials that this can and will be an effective treatment, the most effective dosing amounts is what is still the biggest question at this point. I will also point out that my results have generally resulted in 25% success, HOWEVER this is from using Usnea as a last resort medication when others have failed, so this is actually relatively good number when that is considered. I will soon start using this more as a "first treatment" especially for gill injuries/infections/inflammation to find more results as to use of Usnea in mode of treatment. Feedback from a few clients has been better when used as a bath, with often positive results when used for generally gram positive infections or even Fish Tuberculosis (I am not recommending this for human TB, please see a doctor for this). The only dangers that have been established (in human studies) are in rare cases liver damage, which would make this a poor choice for dropsy. As for related Disease Prevention Suggestions; the use of UV Sterilization is a proven method of fish disease prevention not only due to removal of many water born disease pathogens, but by improving the Redox Balance and thus the Fish' natural immunity. The key is a properly installed, quality UV Sterilizer, not one of the many Cheapie models such as the AquaTop PFUV-40 Hang On Filter. With a quality UV such as the TMC Vecton or Advantage UV, it is also imperative to change your UV Bulb every six months for maximum effectiveness.